When it comes to war, innovation is key and WWII saw more insane ideas and weapons of war developed than perhaps any before it. One of the more surreal was the Antonov A-40, colloquially known as the tank that could fly! Known in Russia as the, крылья танка (literally, “Winged Tank”), the Antonov A-40 was the end result of one, Oleg Antonov, wondering how Russians could get a fully laden tank onto a battlefield without exposing a plane to enemy fire on the ground. Previous to this, they had already experimented with strapping T-37 light tanks and T-27 tankettes to bombers as a means of transporting them as early as 1935. However, both tanks were simply too small to do much damage in combat and risking an entire TB-3 bomber to put one of these tanks into battle simply wasn’t worth it. The Russians also experimented with simply dropping tanks (with and without parachutes) out of planes to see what would happen. As you might have guessed, that didn’t exactly work out. In these cases, the crews were required to parachute down separate from the tank, then hopefully get to it before enemy troops and without being killed in the process. A better plan was needed. In 1940, Oleg sketched a design for a set of glider wings that could be outfitted on a much larger tank, enabling it to fly if towed behind an aircraft that could get it up to speed. On paper the idea was genius, since it solved the problem of exposing the transporting aircraft to enemy ground fire as well as the weight limit of the TB-3 that had restricted what it could transport to very small tanks. However, it would take another 2 years and a German invasion before anyone asked Oleg to actually build and test his design. Once he did, he attached a pair of custom built wings to a modified T-60 tank. After the tank glided down to the battlefield, the wings were designed to be ejected upon landing. If you’re wondering how the tank’s pilot steered the thing, that too was a work of simplistic genius. Its wings were controlled by the movements of the tank’s own turret. Moving it up and down, for example, would allow it to adjust pitch; moving it left or right would allow it to bank, left or right. While this might sound good in theory, because of the extreme weight of the tank and the limited lift the wings could actually provide, armaments, fuel and even armour needed to be removed from the T-60 to get it into the air for the test flight. That said, according to the Russians, the A-40 had a successful test flight, though “successful” is maybe too strong of a word. 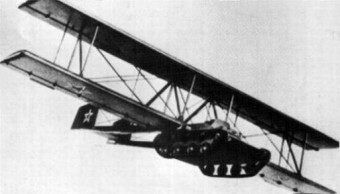 As for the flight itself, the Tupolev TB-3 bomber towing the tank had its engines overheat and they nearly failed almost immediately after take-off. Because of this, the TB-3 had to cut the tank free earlier than expected. Even still, Sergei was able to guide the tank in and reportedly landed “very smoothly” in a nearby field. He was even able to drive the tank back to headquarters to report on the success personally. While he reported a smooth landing, it was pretty tricky business. It required Sergei to start the tank’s engine and engage the tracks just before it hit the ground, along with actually landing it. Questioned about the experience afterwards, Sergei was apparently very excited about the ordeal, but was skeptical about how it would have turned out had the tank been fully loaded as it would need to be in battle. With the TB-3 struggling to pull the slimmed down tank; the fact that project was eventually set on making the significantly heavier T-34 tanks fly; and a good number of TB-3 planes needed to tow the contraption had been destroyed by the war, the project was scrapped. That’s not to say some officials didn’t see the benefit of flying tanks raining death from the sky; it was just agreed that it was a much better idea to use the limited resource of bombers at their command for a more conventional purpose… like bombing things. A damned good number of tank battles occurred in wooded areas during ww2. Look at the regions most conflict occurred. Hell of an idea, but nothing is gonna stop that tank from hitting a tree in final descent. A few tons of steel, diesel fuel and high explosives filled with living humans gliding down into a fire fight, almost certainly happening in or near a wooded area, that is or is not possibly filled with ravines, ditches and mines. This is why I loved the soviets. No matter how bad an idea; they were always willing to try it. God bless Vodka.